The Colonist, and Van Diemen’s Land Commercial and Agricultural Advertiser. Printed and published by Gilbert Robertson at the Printing-office of A. Bent, 67 Elizabeth-street, where all communications (post-paid) are requested to be forwarded, addressed to the Editor. Letter-box in the door. Weekly. Annual subscription 40s. (26s. if paid in advance). Motto: England expects every Man to do his Duty. Digital version is available on Trove. Prospectus also printed separately by Bent. 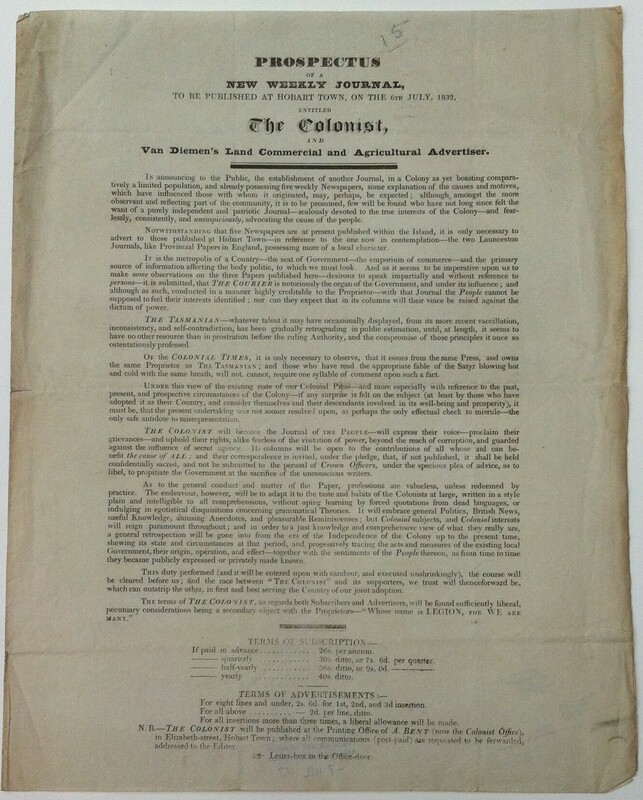 The Colonist was established as an independent and patriotic journal avowedly advocating the cause of ‘the people’ and regularly transmitted to England. The initiative came from George Meredith, who became joint trustee proprietor with his friend Thomas Gregson. The paper was intended to be a joint stock concern, but it soon fell into disrepute, and its support group, loosely referred to as the ‘Legion,’ failed to take up shares. Bent had sent to England for new presses and type, probably not long after selling the Colonial Times, and the Colonist commenced when they arrived. The printing was done by Bent at 67 Elizabeth Street, under contract. According to the paper’s first editor Gilbert Robertson Bent also received five percent of the profits for managing the accounts. Although obviously involved to some degree in the day to day running of the paper, he kept clear of any legal liability. The paper had a turbulent short life. The first legally registered printer/publisher was Robertson (6 July 1832-16 Nov. 1832). He was also appointed editor but his libelous articles and suspect loyalties led to his sacking after increasing friction with Meredith culminated in a violent quarrel. The registered printers were then in turn: Gregson (23 Nov. 1832-16 Apr. 1833), G. H. B. Gellard (23 Apr.-July 30 1833) and T. A. Lascelles (6 Aug. 1833-22 July 1834). After Robertson’s dismissal Thomas Horne was briefly editor on a voluntary basis, followed by F. E. D. Browne, who was paid for at least a year and a quarter, although he publicly denied being the editor. Jorgen Jorgenson also contributed early on, and later sued Bent for unpaid wages. Meredith hoped to employ Bent’s former editor Henry J. Emmett but these plans were thwarted when Governor Arthur, who later claimed he acted only out of kindly concern for Emmett and his family, warned of the possible consequences to Emmet’s four government-employed sons if Emmet were to become involved with an opposition newspaper. Meredith himself faced censure for allegedly bribing a ticket of leave police office clerk to obtain documents and was in consequence denied any further assigned convict servants. The timing suggests that, as Meredith himself obviously thought, he was targeted because of his involvement in the newspaper. The successive proprietors, registered printers and editors were subject to numerous libel prosecutions. Gregson was prosecuted for libels on Roderic O’Connor and J. T. Gellibrand and fined for the latter. Another prosecution instituted by R. L. Murray appears to have lapsed. Meredith faced court for libels on O’Connor and Major Schaw and had to pay damages. The unfortunate Gellard was fined and imprisoned for a year for an article suggesting that a prisoner had been flogged to death which appeared in the very first issue for which he was responsible. Browne was prosecuted for the same article but acquitted. Lascelles became embroiled with magistrate Thomas Mason over Mason’s conduct towards convict Joseph Greenwood and its lengthy aftermath. At this time there was extreme hostility between Meredith and Murray who relaunched his Austral-Asiatic Review to counteract the influence of the Colonist. Both papers engaged in violent personal exchanges and scurrilous abuse. By the middle of 1834 Robertson, who ever since his sacking had been scheming to regain control of the Colonist, was back in the editorial chair, although Lascelles’ name still appeared in the imprint. Robertson relaunched the paper as the True Colonist on 5 August 1834.